When the analytics website Pro Football Focus recently published its list of the 25 top breakout players from the 2015 NFL season, it was no surprise that quarterback Derek Carr was in the group at No. 7. But the Raiders had another player on the list who does his work in the shadows of the trenches, rarely getting much attention. Left guard Gabe Jackson – selected in the third round of the same 2014 draft as Carr – came in at No. 20. Jackson, a former four-time All-SEC honoree at Mississippi State, showed great promise during his rookie season after winning the starting job in training camp. But in 2015, Jackson took his game to a much higher level in his first season working under offensive line coach Mike Tice. 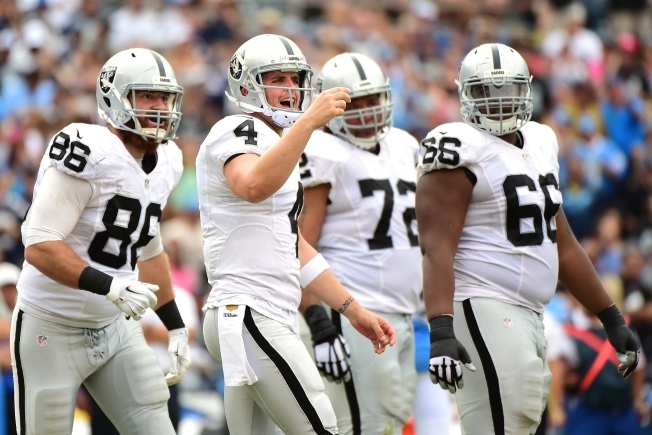 By midseason, the Raiders offensive line had become a strength of the team, and Jackson – a particularly physical run blocker – was one big reason for it. He and veteran center Rodney Hudson had formed a fine 1-2 blocking punch in the middle of the line. Pro Football Focus gave Jackson a cumulative grade of plus-6.8 on 836 snaps during his rookie season. That grade jumped to plus-18.0 on 1,089 snaps in 2015. As the Raiders approach free agency and the draft, they likely will try to beef up their front five. But Jackson, a 6-foot-3, 336-pounder will be a foundation piece for years to come, at just 24. ... Another solid season in 2016 could prompt general manager Reggie McKenzie to strike a longer-term deal to lock him into a silver-and-black uniform. He’s currently signed through the 2017 season, with bargain base salaries of $615,000 and $705,000 over the next two years.